Night and day. Day and night. Whatever the time, you can’t be sure of UK banking. Nationwide was hit by app and online banking problems over night. At 09:35am this morning (30 January), the building society said it went down at an unspecified time but was “working as normal”. As is often the case, it doesn’t give details as to what went wrong. 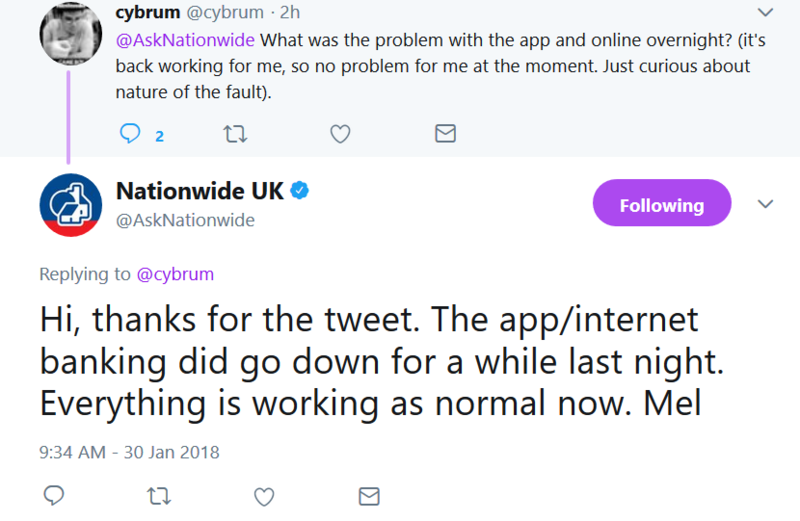 On Twitter, customers who were trying to use the service were told to use an alternative browser and not to go through a search engine to get to Nationwide’s website. Naturally, this resulted in many complaints from Twitter users. You have to feel some measure of sympathy for Nationwide’s social media team. They have to answer the same tedious queries every day. Banking issues seem to never end. Wherever you are. Yesterday (29 January), Australia and New Zealand-based banking group, ANZ, had its internet banking service go down for eight hours. A few days ago, the Bank of England (BoE) said it resolved its technology communications problems following a regular internal IT update on 25 January.